Another 13 Craft Breweries Opening in BC in 2014. Hey BCer’s I hope you’re thirsty cause THIRTEEN more breweries are opening up this year in BC. This year, at least another THIRTEEN breweries are planning to produce more beautiful, all-natural craft beer to stave off the province’s seemingly insatiable thirst. (I say “at least” because more breweries appear to be flying under the radar in case they make promises the LCLB might break.) Six of those are due to open (or already opened) within the first few weeks of the year. That’ll take the number of craft breweries in B.C. up to SEVENTY-SIX, by my reckoning — and raise the number of all breweries to more than 80. What’s noticeable again is the geographical spread. This year should see new breweries opening as far north as Terrace, as far east as Penticton, as far south and west as Victoria, and as central as Quesnel. Vancouver, however, continues to see the most growth. The beer: A pale ale and an IPA are currently availabel, with a red ale due in mid-February. Three or four more beers are planned for the summer, starting with a wheat ale. Kegs are currently available for purchase, with 650-ml bottles set to be available by mid-February. “We have been brewing on the SABCO in garages, back yards and now our current sub-leased warehouse space in South Vancouver since June 2009 and have a product we are proud of. We have read every book on the market, listened to hundred of hours of brewing podcasts, read nearly every thread on Pro Brewer and have the guidance of some of our local beer heroes. “… Evan and I have definitely started out on the grass roots side of things. Homebrew clubs, smaller capital operation, support from our friends, family and community. “We have big plans, but every step of the way we want to be able to give back to the brewing community as well as the small business community in Vancouver. Soon after we have leased a location, we are planning on starting a small crowd-funding project for the brewery. The beer: Expect organic beer with focus on local ingredients and suppliers. Sales of cans, kegs, casks and growlers. The Dogwood website lists four beers: Fest Bier (30 IBUs, 5.5%), Imperial Stout (30 IBUs 11%), Hello, Bumblebee Honey Ale (25 IBU 5% ABV), India Pale Ale (100 IBUs 9.5%). Seasonal beer planned, too. The beer: Mostly English and West Cost ales. Pale Ale, IPA, Golden Ale, Brown Ale,Best Bitter and a Winter Ale are underway, as is a barrel-aged version of the winter ale. The people: Owner/founder Martin Ebadi, an Iranian ex-pat with a long-term interest in craft beer who noticed a niche in the Lower Lonsdale neighbourhood of North Vancouver. Brewers are Bill Herdman and Marc Martin. The beer: Primarily American-style ales. The brewery launched with a dry-hopped pale ale and a stout, and Bitter Leaf IPA has just been released. Liquid Sunshine, a 100-per-cent organic weizen, will be available early February. Brewery extras: The brewery will have a tasting room and sell one- and two-litre growlers. The plan is to approach off-site draft sales slowly and to focus on the Lower Lonsdale neighbourhood to start. The people: A collaboration between Cameron Forsyth of Portland Craft, Nigel Pike of The Cascade Room and Robert Edmonds and David Nicolay of Evoke Design. Jack Bensley, formerly of Russell Brewing, will be brewmaster. The beer: At least three year-round brands are planned as well as seasonals and casks. Led by Main Street Pilsner, which has been brewed at Russell for the past couple of years or so. Draft only to start, with 650-ml bottles and cans to follow. Brewery extras: Tasting room and retail area to sell growlers and packaged product. The beer: Not giving much away yet, but drawing on Schulz’s experience, a mixture of German, English, and North American brewing styles, techniques and ingredients will be employed for a mix of classic and newer beer styles. Steel Toad Brewing Company Ltd.
Secretive 240-seat brewpub planned for the redeveloped Opsal Steel Building, where brewing tanks are already in place. This licensing report has some more technical details. The beer: An unfiltered Belgian Abbey-style ale (6.5%), with seasonals also planned. 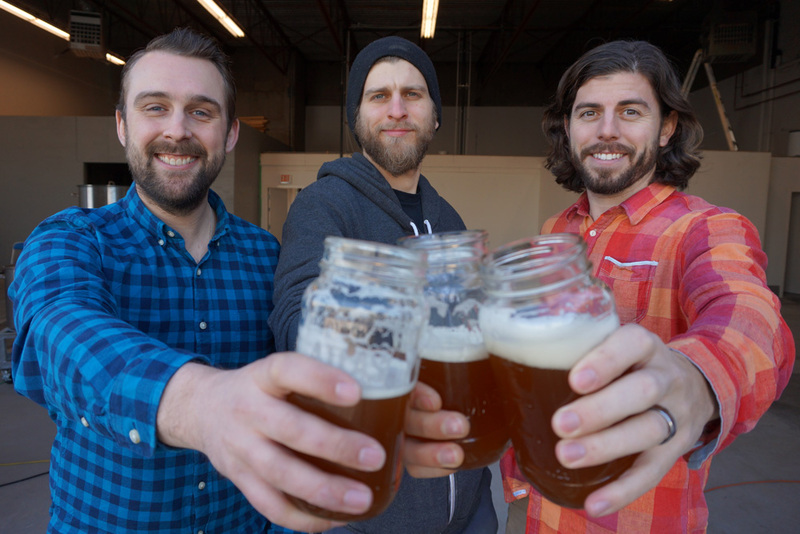 The people: Co-owned by Craig Outhet (head brewer), James Witzke (marketing/brewer), Kent Orton (finance/brewer), all of whom have been homebrewers for four years. The beer: West Coast-inspired ales. Hoppy and flavourful, using local ingredients when possible. Seasonal and session batches are planned using natural flavourings such as cedar, spruce, juniper and elderberry. The brewery opened with Gillnetter Golden Ale, Flagship Pale Ale and Blacksmith Brown Ale available on draft and in in 340ml bottles — and sold out within four days. Brewery extras: Tasting room, keg sales, bottle sales and possibly growler fills. The beer: Exclusively Belgian styles. Starting lineup of two regular beers, with four or five seasonals a year.